Organizer needed! There is a strong interest in bringing back the Study Group, but no one to head it up. Last year we met once a month and talked about a different body system and our favorite herbs for that system while enjoying tea and eachother’s remedies. It was fun and informal and a great way to connect the community with the Guild’s vision of local educational outreach. HELP NEEDED setting up + running the Guild’s market booth for 12/27, 1/3 2:45-6 pm. Please contact anna4hope@gmail.com if you can cover this shift. Claudia + Michelle are offering Cultivate Wellness Studio to the Guild to host an Apothecary and Herb Exchange! – Can sell herbs + products/offer class/host a study group/etc. – Claudia is donating tinctures and herbs for donation to the guild. Anyone can do the same. – Consignment: 70% (Maker)/ 20% (Re:Evolition) / 10% (Guild) breakdown? -Twinkle Thursdays: sip + shop events each Thursday next month, downtown stores open until 8 pm, support local businesses! Announcement: An RV IS BEING DONATED! Donna is donating her RV to the Guild to serve as a mobile clinic!!!! – Insurance about $140/yr for Donna, may be more for the Guild? – We could have a fundraiser/GoFundMe to help pay for it?? – organizational meeting coming soon to discuss expansion, marketing, etc. – over all doing well + making money! – we will be paying farmer’s next round! – we need elderberries and ginger! We might be able to contract grow. 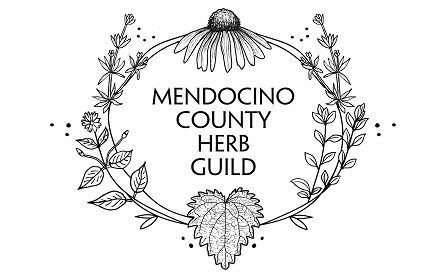 Please email the Guild info@mendocinherbguild.com if you can grow either of these items. -Food Hub is offering to be a distributor + connection between farmers, driving from point A to point B! – 20-25 kits, $50 for a small size, $150 for a large? – ideas: 10-15% goes to Guild, herbalists contribute different products and get back the retail value of their products once it sells on consignment –or– Guild could buy wholesale products? – Pod created, next step is to meet up and discuss logistics, then bring numbers back to the guild. – contact Miguel for more info. – Dessert + Elixir Bar: made net ~$300, hot drinks (cocoa, chai, tea) were the most popular. Next time get more help and possibly more space. Potentially serve dessert at the table. – Tremendous gratitude to farmers, who donated 80-90% of our entire meal! – Vendors: next yr figure out how to direct people there more + maybe charge higher fee? – Online payment: paid $50 total fees for all tickets sold. Seems worth it, next year we can charge the fee to the customer. Most tickets were sold online. – WELL sponsored our insurance for free -> send a thank you in words and $$! -December will be about pods meeting and working on projects!